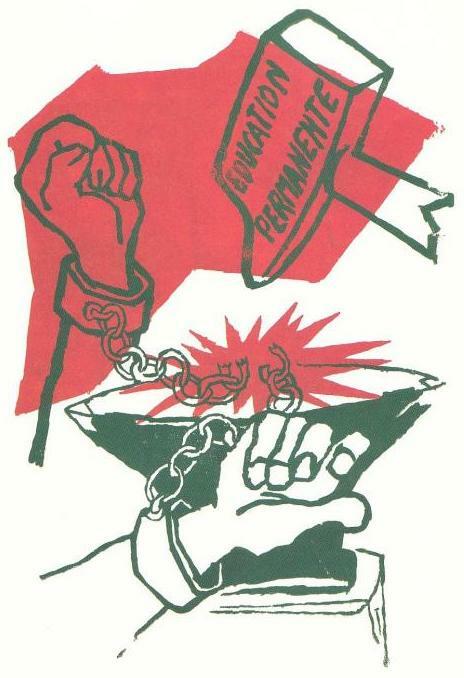 A poster produced by Atelier Populaire during the May 1968 Paris student and worker revolt. On May 16, 1968, artists and art students began a permanent occupation of the École des Beaux-Arts. In the occupied school, Atelier Populaire produced and distributed a series of posters to "give concrete support to the great movement of the workers on strike who are occupying their factories in defiance of the Gaullist government." Courtesy of libcom.org. Hosted by 221A Librarian Vincent Tao, the Autonomous Education Study Group will investigate ‘the university’ as a means and ends of political struggle. The syllabus will read critical theories of education against documents of ‘official discourse’ produced by academic institutions in the Lower Mainland of British Columbia. This study will serve to map the terrain of today’s neoliberalizing universities and draw a horizon for organizing student power. Vincent Tao’s projects at 221A include Notes on Political Ecologies, N.O.P.E. 2016; Rereading Room: the Vancouver Women’s Bookstore, 2016; Parallax Study: The New Romantics, 2017; and Deep Blue Open Archive, 2017. Tao took part in documenta 14’s aneducation program at Under the Mango Tree—Sites of Learning, travelling to Kassel to present and workshop 221A’s educational programming. His independent research and organizing work concerns urban displacement and the right to the city. Prior to moving to Vancouver, Tao studied at McGill University in Montreal, where he was the outreach coordinator for a worker-run community kitchen.